Since the day I first saw the multi touch screen on an iPhone I thought that multi touch was simply amazing. It still is! 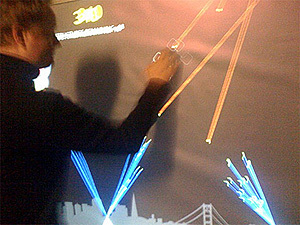 It just got better though with the introduction of a massive 8′ x 4′ multi touch wall capable of playing Missile Command. The clone of this game was created by Steve Mason from Obscure Digital Production Studios. As gizmodo mention, it looks like a good work out and a good time!